October is one of my favorite months of the year. For as long as I can remember, the 1st of October is a day in which I plan out the month ahead. As I have gotten older and started traveling more, I have been able to add “Visit Spooky Travel Destinations” to my list of traditions. The US West Coast is filled with fun places for children, towns for the entire family to enjoy, and some downright terrifying stops. Happy Halloween month! The “Most Magical Place on Earth” goes all out for their Halloween celebration. From September 7th (they start even earlier than I do!) to October 31st they decorate the park, change up some rides, and even offer a special after-park-hours event. The Pumpkin Statue is busy all day long, and to get a photo with it you will have to wait in line! Last year I had a chance to visit! This coincided with the inaugural themed celebration at Disneyland’s sister park: California Adventure. Each park had its own fun touches. It is worth it to buy the Park Hopper ticket at this time of year, to access all of the Halloween fun in both parks. Children 3 and under are free, Ages 3-9 are $160.00 and adults will run you $167.00 per Park Hopper Pass. In Disneyland, the Main Street becomes a Pumpkin Festival. The street is lined with jack-o-lanterns, and you practically walk right into a huge Mickey Pumpkin upon entry. Characters transform too! Last year I got to see both Minnie Mouse and Goofy in their spooky attire. The Halloween fun starts right at the entrance! The fun does not stop there, because certain rides offer themed experiences. Both Space Mountain and Haunted Mansion become even scarier rides. Space Mountain Ghost Galaxy is predominantly for older children. Although it has a height requirement of only 40″, it is completely in the dark. FastPasses are available for the ride, and they are beneficial at this busier time of year. Haunted Mansion Holiday melds The Nightmare Before Christmas with the original, already scary ride. We did not get a chance to experience it, because Fast Passes ran out around 4 PM. Goofy is all dressed up for Halloween! 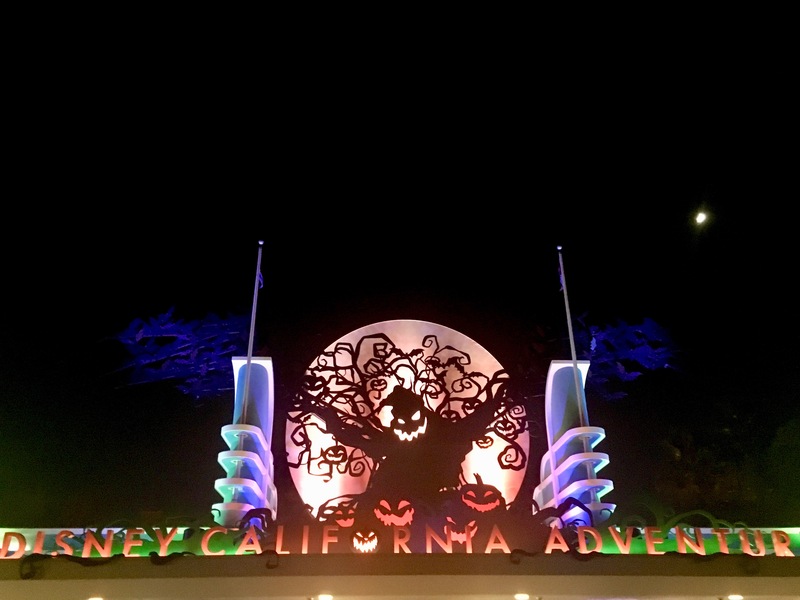 California Adventure continues the Nightmare Before Christmas theme, with Oogie Boogie greeting you at the entrance. A Headless Horseman Statute awaits in the park. If you stick around long enough, you will see the cool effects added to the statue. The biggest change to the park is Cars Land. Luigi’s Honkin Haul-O-Ween and Mater’s Junkyard JamBOOree are perfect themed rides for younger kids. My favorite Halloween addition of the entire park was Guardians of the Galaxy: Monsters After Dark. Although I was very upset that Disney built the ride in what was previously Tower of Terror, this makes up for it. The lovable characters from the Marvel movie paired with the drop factor will leave you full of adrenaline! Visiting California Adventure at night was a treat! Monsters After Dark is officially one of my favorite rides at Disney! If you grew up watching Disney Channel (Family Channel in Canada) in the late 90’s and early 2000’s, you have probably seen the movie “Halloweentown”. The story revolves around a teenage girl and her family, who find out they are witches from another realm. My sister and I spent our childhood watching this movie, and its sequels, together! Back in 1998, the movie was filmed in St. Helens, Oregon. Every year since, the town has put on a month long festival, transforming the town and hosting events. Whether you have seen the movie or not, there is something for everyone in the family. Meet Benny, the skeleton cab driver from the movie! Some of the activities include photo ops around the town, a haunted house that is accessible for both children and adults, and movie marathons. This year, I got to attend the 20th anniversary celebrity pumpkin lighting. The original cast were all present to light the pumpkin (minus Debbie Reynolds, who sadly passed away in 2016). To see the cast of a movie I watched year after year as a child was magical. To see so many people show up for this event was also magical. If you’re a fan of the TV show Grimm, this year there are also actors from the TV show (filmed in nearby Portland) putting on events at the festival. The town itself has such charm, being located right on the Columbia River. It remains a small town with antique shops and an old-style movie theater. Best part? Touring around the town is free! Visiting during the Celebrity Pumpkin lighting was such a cool experience, even for my husband who is not the hugest fan of the movies! The story of the Winchester Mystery House is a unique one. Its owner, Sarah Winchester, lost both her husband and her daughter at a young age. She was convinced this was because their family had made their fortune in Winchester Repeating Arms. Their rifles amassed many casualties throughout the Civil War. Sarah spent almost 40 years constructing a mansion, non-stop. There are some pretty odd features: a staircase that leads nowhere, a door that opens from the 2nd floor to a drop down below, and a creepy seance room. It is said these designs were put in place to confuse spirits. The house has been home to many paranormal sightings over the years. There are questionable pictures taken by employees, video surveillance footage, and many individual people who report their own experiences. While I have been there twice and have tried really hard to see something out of the ordinary, I have had no such luck. *Note: There is no picture taking inside the house, so make sure you get a chance to take some around the grounds and in the beautiful garden! I was desperately searching for some paranormal activity on this hot October day! The house itself is beautiful, and any tour you take will leave you a little bit spooked. The standard Mansion Tour lasts just over an hour, and a guide leads you through the never-ending house. Last year the Explore More tour began, and it takes you through newly opened rooms. Adding just $10.00 to your standard ticket price of $39.00/adult or $20.00 Ages 6-12 will get you an extra hour in the house. I took this tour, and I have to say that there is something infinitely creepier about it. On this tour you have to wear a hard hat due to the sensitive nature of this part of the house, and it is an Age 10+ tour due to safety concerns. The house itself is so beautiful! During Halloween time, there are added Candlelight Tours that occur at night. This tour will cost you $49.00/ adult or $19.00 Ages 6-12. This year the theme is “13th Door”, where you tour through 13 spooky doors that all have a significance to the house. I can imagine that being in the dark makes the house seem much more scary. The gardens in front of the house are well maintained, and give you a good excuse to walk around the house looking for ghosts! You can find the mansion on many “ghost hunter” shows, so if you are a fan of those, chances are you have seen this house. Whether you believe in those sorts of things or not, the house is certainly an oddity. The architecture is beautiful, and the madness that drove Sarah Winchester to build and build and build is certainly intriguing. For more West Coast adventures, check out my US West Coast Road Trip post! While these are three of the spooky travel destinations I have been to during the month of October, there are many other creepy places to check out. Portland is known for celebrating Halloween all month long. The offshore former prison Alcatraz, located in San Francisco, is said to be haunted, and offers night tours at this time of year. And my personal favorite? The Whaley House in San Diego. It holds the title of the “Most Haunted House in America” and has a tumultuous history. I have some unexplained pictures from my time there, and had an eerie feeling throughout my experience. October is the perfect time to celebrate a bit of spooky in your life. Whether you are scared of these sorts of things, and prefer pumpkin patches and Disney movies (Hocus Pocus, anyone?) or love to be scared out of your mind at haunted houses, there is are spooky travel destinations for everyone! Thanks so much! Although they are cooler at Halloween, these places are still awesome any time of the year, decorated or not!!! Interesting and fun post! I’ve heard about Disneyland but Halloweentown is something new. Gotta add these places to my bucket list. My daughter would love to visit these spooky attractions. I hope you get a chance to see Halloweentown, it is a very special place! Thanks for reading! Spooky! I’m the type of person who creams and jumps during ghost tours, so I’m not sure I could tour a real life haunted house! It definitely takes some bravery to take the tour, although there are usually many people in the house so it doesn’t seem as scary! The US seems like the place to be for Halloween-themed trips! It seems to be a country where people really do go all-out! It is! It is the country where everyone goes all out for all holidays and occasions! What a perfect, timely post! I am obsessed with your posts from Halloweentown — although.. gosh what a creepy, creepy movie. I loved traveling to Salem, Mass but it was SUPER crowded when we were there.. Thanks so much! Halloweentown is super fun! I can imagine that Salem gets insanely busy all October long, that is another spooky destination on my list! I found that so interesting, that Halloween seems to only be a big holiday in North America! Great round up! I once stayed at a ‘haunted house’ Airbnb in Seattle, and I was lucky enough to spend Halloween in Salem, MA a few years back. As an Australian I don’t have much experience with Halloween, but spooky stuff is always fun for sure! I didn’t know we had haunted house Airbnbs here- I live in Seattle! I can imagine that Salem was extra scary and extra busy during Halloween!!! An awesome post! I LOVE Disneyland and Disneyworld, so celebrating holidays there is a no-brainer. My brother lives in Portland and I’ve visited him there in October, and there’s this amazing house that the owners have converted into a creepy dollhouse for the week leading up to Halloween – you have to visit, it’s hilarious and quite impressive! I have heard that Portland goes all out for Halloween, and that there are many houses that get all decorated. That sounds like a fun/spooky time! There is no place to be for Halloween like the US! Carved pumpkins everywhere and candlelight tours of spooky houses – so much fun. And all things that bring generations together! This post is so full of Halloween energy that as I was reading it, there was lightning and thunder outside. Not kidding. Happy Halloween! Oh that must have made for a spooky read! The US definitely takes Halloween to the next level, as it does for many holidays! Don’t forget the Queen Mary! A haunted ship. I’ve never been but it’s on my spooky destination list! My best friend and I used to do Halloween Horror Nights at Universal in Orlando. It was so much fun. I’ve also been at Disney World during Halloween, but never Disneyland. It would be fun to travel to the west coast to experience Halloween. That house in San Fran seems very creepy. Oh that sounds awesome, I have heard the one at Universal Hollywood is also pretty spectacular. Traveling to the West Coast is a good idea at any time!!! You HAVE to pay the West Coast a visit, it is so different from everywhere else in the country. It is so cool to have forests and mountains and ocean all in one place! That sounds like a really great adventure. Going to Halloweentown is a dream of mine. It is such a cool place! I was especially excited to go this year, as it was the 20th anniversary of the film! Thank you so much for sharing your travels. I have never heard of some of these spooky places. I cant wait to visit. Thank you so much for reading it! I hope you get a chance to experience a West Coast Halloween! These all look great fun! Halloween at Disney is the best! Disney during any holiday is the best! Disney in general is the best! This is a great roundup! I haven’t been to any of them, but sounds like it’d be fun! Thanks so much, it is definitely cool to add some sightseeing to Halloween fun! The Mystery House is beautiful! I had no idea. I think a fall trip next year will need to be on the books! Great list!! It is super cool, even if maybe it is not haunted! Seeing such a huge and odd house in the middle of a now busy city is so unique! Halloweentown is one of my favorite movies!! I would love to travel to Oregon and check out that town!! Yay, I’m glad someone else knows it and loves it!! It is a pretty cool town! I love anything that deals with spooky. And since travelling to California is one place I love to go, I am looking for to the places your recommend. Califorinia is a great place to visit in general, and has so many cool spooky things to do! This looks really fun, definitely need to check this out! Awesome! All of the attractions are fun in their own way! What a fun post this is – Headless Horseman Statute, Candlelight Tours, Haunted Mansion – my kids would love to “freak-out” 😉 at such awesome spooky destinations. Thanks so much! I love that Disney puts on a huge thing for kids, “kid” scary is sometimes the best kind of scary! I love the the idea of Disney Halloween but the Winchester House sounds so bizarre! I think the candlelit tours would certainly add some atmosphere. The Winchester House is definitely an interesting place, even if you just visit for what a weird house it is! What a fun post! I’ve lived in San Jose most of my live and have passed by the Winchester mystery house a zillion times but yet to go in 😂. We should make it happen this Halloween. Thanks for sharing. That’s crazy, you should definitely check it out! It’s such a cool house, haunted or not! What a fun article! I love your enthusiasm for all things spooky! I once stayed at the Shanely Hotel which is one of the most haunted hotels in the US. So I share your love and will be saving this for the future. That would be a bit too spooky for me, but seems like a cool adventure! Thanks for reading!